Welcome to the official website for the Council Bluffs Fire Department. Click on the links at left for information about our Department. The Council Bluffs Fire Department provides a full range of life safety protection for the 58,000 residents who reside in Iowa's eighth largest City. The CBFD's 100 career personnel give emphasis to all aspects of life safety. This includes fire prevention, firefighting, emergency medical care, technical rescue, hazardous materials mitigation, disaster response, public education and community service. Professionally trained staffs of 100 Career Firefighters (including Paramedic trained personnel) are on duty at all times at 5 Neighborhood Fire Stations strategically located across the Department's 42 square-mile jurisdiction. To protect the lives and property of the citizens of Council Bluffs from Fire and other emergencies. The City of Council Bluffs offers to its citizens the CodeRed Emergency Notification system - an ultra high speed telephone and cell phone communication service for emergency notifications at no cost. This system allows us to telephone all or targeted areas of the City in case of an emergency situation that requires immediate action (such as a missing child, evacuation notice, hostage situation). The CodeRed notification system can also deliver messages to you about major street closings, water outages and other issues that impact your area of the City. In addition to the emergency notification, you can also sign up for weather warning notifications (Tornado warning, thunderstorm warning, flash flood warning) at no cost when you register for the service. To register your home, business or cell phone numbers, click the link below or the Code Red picture. Your phone numbers will not be shared or used for anything but the emergency and weather notifications. *PLEASE NOTE: To read this document, you must have Adobe Acrobat Reader installed on your computer. If you do not have Adobe Acrobat Reader, you can download it for free by clicking on the icon above. 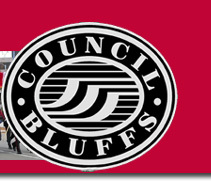 � Copyright 2012 City of Council Bluffs, Iowa , All rights reserved.